To exclude the driver as cause of a seemingly randomly occuring problem, I decided to update the Broadcom NIC drivers on 2 ESXi 5.0 hosts. Download the latest drivers here and extract the …..-offline_bundle-xxxxxx.zip file. If you read this blogpost months or years after I created it, check for newer updates of the driver here. If you DO have vMA version 5.0, here is an excellent guide on how to update drivers. So I’m using a SSH connection to the ESXi 5.0 hosts and I use the command line to update the hosts. First, use WinSCP to transfer the update file, BCM-NetXtremeII-1.0-offline_bundle-553511.zip in my case, to the ESXi 5.0 host. I placed the file in /tmp because it will be deleted when the host is rebooted. Seperate multiple managers with comma’s. No spaces. Adjust your community names accordingly. Because I had to clear out 2 LUN’s I ran into the problem that moving vCloud Director VM’s through vSphere is a bad idea. 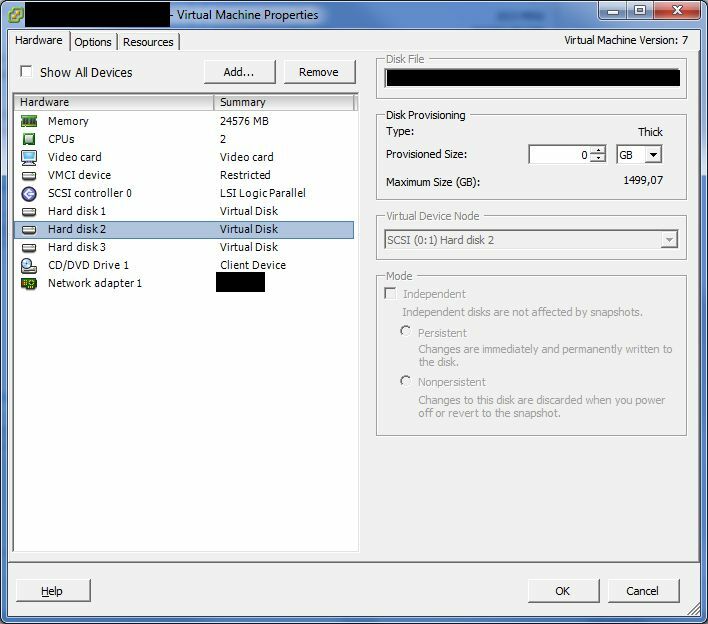 Luckily I remembered a blog post made by the brilliant William Lam not so long ago: Performing A Storage vMotion in vCloud Director Using vCloud REST API. This will be the basis of the solution. Please note I’m using vCloud Director 1.5. Now it’s time to call the REST API’s. First, download cURL. Since I’m using Windows, I got the curl-7.25.0-ssh2-ssl-sspi-zlib-idn-static-bin-w32.zip from the Win32 section. This command differs from what is posted on William Lam’s blog. When I specify the ‘&fields=name,vCloud’ parameter, I receive the error ”fields’ is not recognized as an internal or external command, operable program or batch file.’, so I left that out. You will get another HTTP/1.1 200 OK response followed by alot of XML code. Look for the <AdminVMRecord tag. This will indicate the start a code block for a VM. 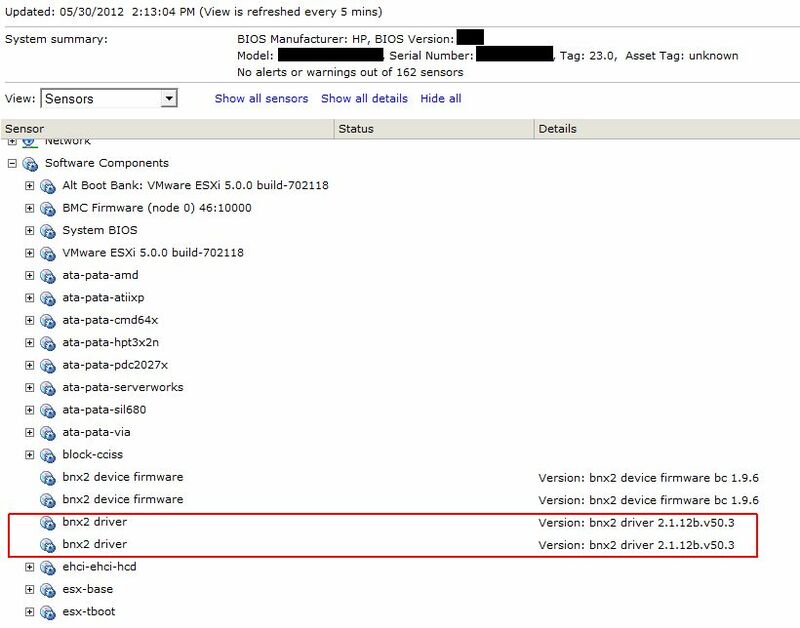 On several occasions I saw the vCloud Director server issue a consolidate command on a VM before it executed the svMotion. Exactely the reason why you can’t do this through vSphere. Because some of the svMotions took a long time, I had to get new a session key several times. Just execute the first curl command and replace the returned session key in your svMotion command. Good luck and I want to give another shout out to William Lam for publishing his solutions to difficult, highly technical problems. Follow his blog here. 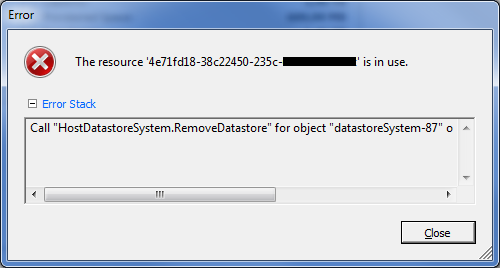 While trying to delete a datastore I receive the error “The resource ‘[VMFS Volume ID]’ is in use”. After checking the datastore I found a vmware.log file. The contents of this file pointed me to the VM that was using a hardcoded path to the datastore as log.filename parameter in it’s .vmx. Shutting down the VM, editing it’s .vmx with vi quickly fixed this problem. without success, I was left baffled and empty handed. I decided to sleep on it for 1 night because there was probably something I did wrong or something I overlooked. to make sure. And indeed, everything seemed OK.
fixed this config error and after this I had no problem to delete the datastore. What this experience really thought me is that if VMware says the resource is in use, IT ACTUALLY IS IN USE. This blogpost is a reminder to myself that sometimes taking a step back is better then to dive straight into the problem. Oh yeah, and of course to READ the error. This blogpost is based on a real life incident. The platform is vCenter Server & ESXi 4.1 Update 2. Please note that vSphere 5 has an improved method for this situation: KB2003638. So what do you do when you have to do maintenance to your Exchange VM? Stop all services and make a snapshot, right? It might be a good idea to stop the VM first, because snapshotting alot of RAM will take some time. After you’ve done your change and you are satisfied it’s working properly again, you delete the snapshot. 66% CSTP. Not good. VMware made a nice KB article about it: KB2000058. Solution? Pretty simple, consolidate your snapshot. But… What if that proces fails? In my case, the VM had high CPU load because it was running on a snapshot disk, high I/O load because a backup process was running. On top of that, I tried to delete the snapshot. When realising the backup was also running, it was immediately paused. Ofcourse, strictly speaking the 2 processes shouldn’t have any influence on each other, but the VM was really sluggish at this time. On top of that, during the consolidation process, vCenter Server lost the connection to the host. So the deletion of the snapshot timed out. First thing to do is wait. Just because your vSphere client doesn’t report it, doesn’t mean the consolidation process has failed. The time you have to wait depends on the size of the snapshot (and the speed of your storage). In my case I waited another 20 minutes. The VM was still sluggish. I checked the hard disk location of the VM and saw it was running on <name>-00000x.vmdk files. Those are snapshot files, so I knew by then the snapshot consolidation process had really failed. This is where it becomes interesting. You are running on snapshot files and your VM is sluggish because of that. Nothing really changes, you still have to consolidate the snapshot. But that has become impossible to do by using your vSphere client because vCenter doesn’t ‘see’ the VM has a snaphot. The solution to this problem is fairly simple and is explained in KB 1002310: Take a (new) snapshot (from the vSphere Client preferrably). When that finished, delete all snapshots. The ‘orphaned’ snapshot files will be consolidated together with the new snapshot. to get the snapshot. For some unknown reason, which is still unknown to me at this point, no snapshot info was returned. Looking back, it might have been possible the snapshot only consolidated completely at that point. Unfortunately I didn’t check at that time. It might also be very possible that corruption had already occured at this point in time. Fact of the case is, the creation of the snapshot in the following step went wrong. So there was something wrong. It bothers me that I can’t pinpoint the problem till this date. The command failed with the ever so lovely error: ‘Snapshot creation failed’. I’m not sure this was the exact error returned, but the information given was basically the same. It remined me of the legendary Windows error ‘An error has occured. Anyway, I also check KB1008058 and I might very well did something wrong while trying to make the snapshot from the command line, because I ended up with 2 snapshot files with wrong CID ID’s in the .vmdk descriptor files. ESXi also saw the error and shutdown the VM. This was actually very good, because a shutdown is always better then writing your datablocks in the wrong data file. I removed the VM from the inventory and added it again. Of the 3 virtual HDD, one showed 0GB. This was the disk with the Exchange database. I wasn’t too worried though, because I knew I still had all data. Time for some intense analysis and read up on KB1007969. Note: The correct thing to do at this point, is to contact VMware support. They will basically do the same as I describe below, but it might be a good idea to let them do it. I only continued because I knew what the problem was and I was pretty sure I still had all my data. I checked the .vmx file to determine the ‘lost’ disk. It was scsi0:1, the second disk. This seemed correct. 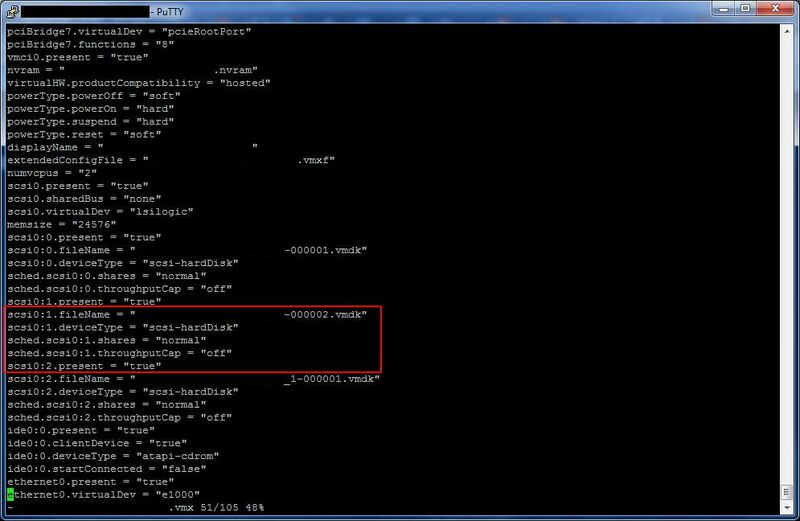 -000002.vmdk showed to be the latest snapshot file the VM was running of. My snapshots were not correctly ‘aligned’, so I couldn’t get any reliable info from the .vmsd and vmsn files. I had 2 snapshot files; -000002 (which was the newest snaphost and which was the snapshot the VM was running on), and -000004. Unfortunately I don’t have a screenshot of the -000002 vmdk file. The parent disk was on another LUN. It’s vmdk file seemed OK. The problem was, -000002’s parentCID pointed to fcbc7dd4, and -000004 assumed CID fcbc7dd4 as you can see below. Knowing that the CID identfiers change during boot , I was quite comfortable to change the CID (NOT the parentCID!). I changed -000004 parentCID to fcbc7dd4 and I changed -000004’s CID to 499d08dd and also changed the final 8 chars of the ddb.longContentID to 499d08dd. Basically, I swapped the ID’s. Now -000004 points to the correct parent. The path to the parent disk was already correct, so I didn’t change that. Now I only had to point the -000002 to -000004 as parent. So I change the parentCID to 499d08dd. The path was correct. I made sure the -000002 and -000004 vmdk files listed createType as vmfsSparse and the extended description also included VMFSSPARSE. I then removed the VM from the inventory and added it again. The disks were now all back to their original sizes. Because the mention of possible data corruption in KB1007969, we contacted VMware support. After 1 hour Adrian White, one of VMware’s Technical Support Engineers in Ireland, assured us that data corruption was pretty unlikely (not impossible). He checked my steps above and verified they were correct. This time around the deletion was succesful. The VM powered up and booted without any problems. There were no further incidents and the VM performed splendidly. As of to date, there has been no report of data loss or data corruption. So inspite of loosing mail capabilities for 4 hours (1 hour waiting for VMware support), the organisation was satisfied with the performance once the mail functionality was restored. This helped alot in the acceptance of the loss of productivity. I also want to mention KB1015180, which explains how snapshots work.